This page is a work in progress. I need to organize the lights better. This is my new headlight beam page. Some of the images are from the original page and were shot in July 2008 and May 2009. Some of the later (larger) images were shot on October 25, 2011, and the Luxos U images on January 14, 2013. The new Edelux II and Lumotec Eyc headlights were photographed Oct 27, 2013. I can't recall the temperatures from the 2008 and 2009 shoots, but it was probably between 60 and 70 degrees fahrenheit. On October 25, 2011, the temperature was 45 degrees fahrenheit, and there was a gentle breeze. 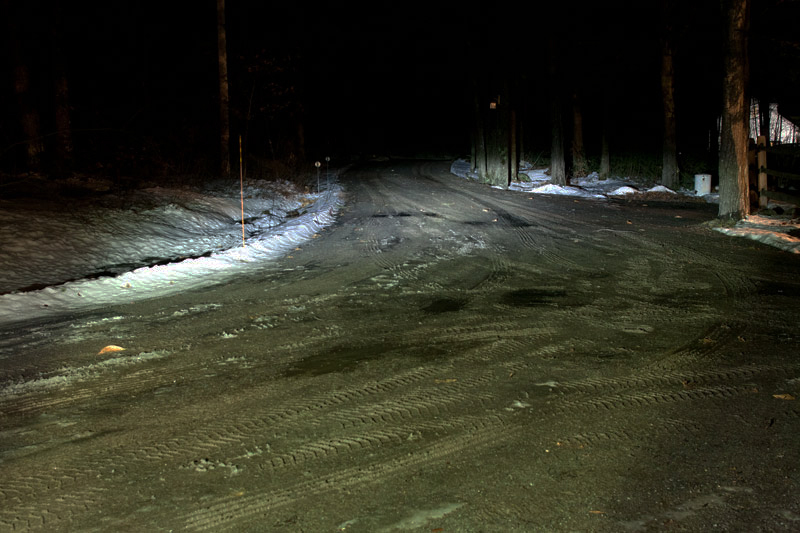 All of the newest headlights use LEDs instead of a halogen bulb. And the efficiency of an LED is affected by temperature. The better headlights keep the LED cooler, and so they shine a bit brighter. So the ambient temperature and wind speed can effect how bright the headlight is. The 2008 and 2009 images of dynamo lights were shot using a Schmidt SON28 hub spun by hand to power the lights. This created the possibility that the various headlights weren't receiving the same amount of power since the wheel could have been spinning at different speeds for each headlight. 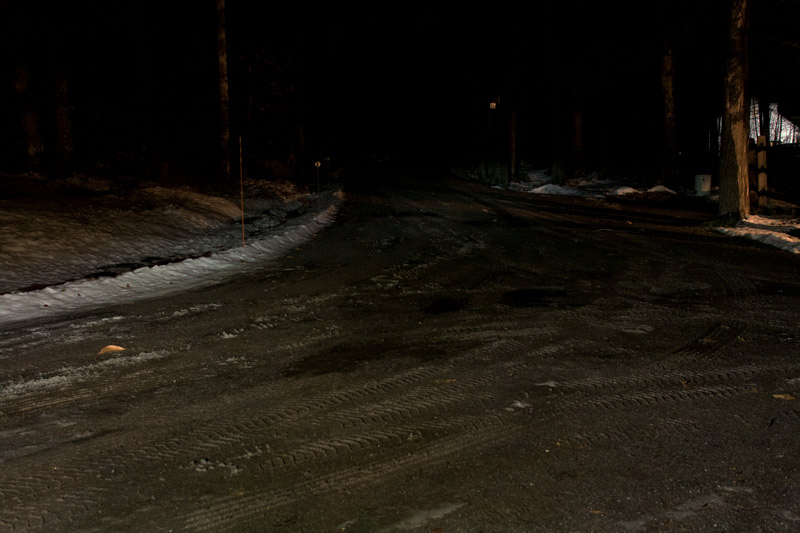 The 2011 images use the Busch & Müller "Light Adapter" to power the dynamo headlights, and the battery headlights are all powered by their standard batteries, fully charged. This makes for a more objective measurement. owever, photos made from January 2013 are all shot using "The Rig". See below. All of the photographs on this page were shot by me, Peter White, and I have written all of the text on this page. The text is very important. 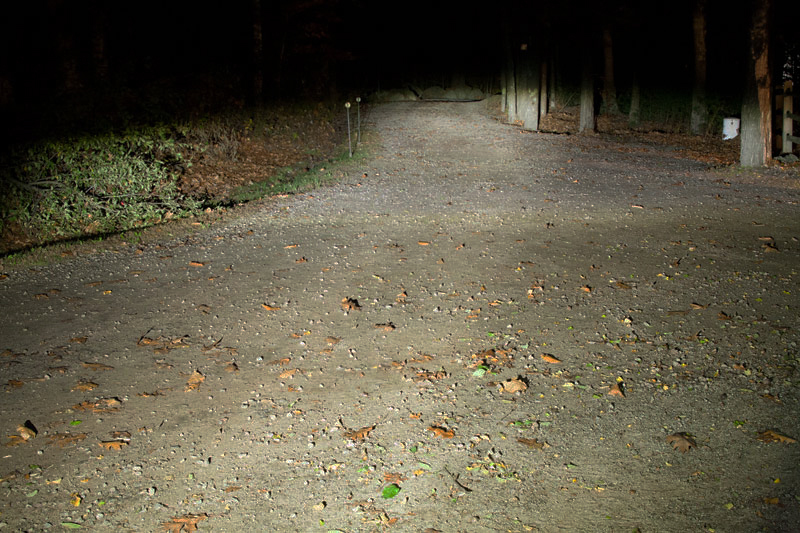 If you only look at the photos, you will come away with a false impression of the relative brightness of the headlight beams shown. You MUST read the text as well. The images don't tell the whole story. The wheel with a SON28 hub is mounted in a Schmidt display stand. Also mounted is the headlight, in this case a Busch & Müller Luxos U. The variable speed drill has a disc mounted which spins the wheel. There's a heavy rubber band pulling the disc firmly against the tire tread. In the 800 pixel wide images, the center of the headlight lens is about 35" off the ground (the mount is at 34") putting it between 3.5" to 5" higher than it would be on bikes with 26" to 700c wheels with the light mounted at the fork crown. The older 600 pixel wide images from 2006 were shot with the light mounted on a different rig. I don't recall the exact height of the lights on that rig, but it was similar. However, both the light and camera were positioned about 20 feet ahead, so the background perspective is a bit different. Shops selling the SON hubs should know that this red stand is available for sale. Schmidt makes them for shops and I keep them in stock. It can mount by its base, as shown, or be mounted on a wall. Your customer can spin the wheel, and see the light shine. Ultra groovy! And here's the daytime view down the driveway. The above two images were made January 14, 2013 as I set up to shoot the new Luxos U headlight beam that night. All of these beam images are made with the same camera, a Canon 5D digital SLR using a Canon 45mm tilt/shift lens tilted for sharp focus on the road surface. This lens has a field of view that's 51 degrees from corner to corner. I set the camera up during daylight so I get the focus correct. The camera's ISO speed, shutter speed and f stop are identical for all of the images; ISO 3200, Shutter speed 1 second, f/5. Unless noted, no image processing was done to any of these images other than size reduction, both to the physical size and the file size using JPEG compression. This has no effect on what you see here. It only speeds up the downloading time to your computer. 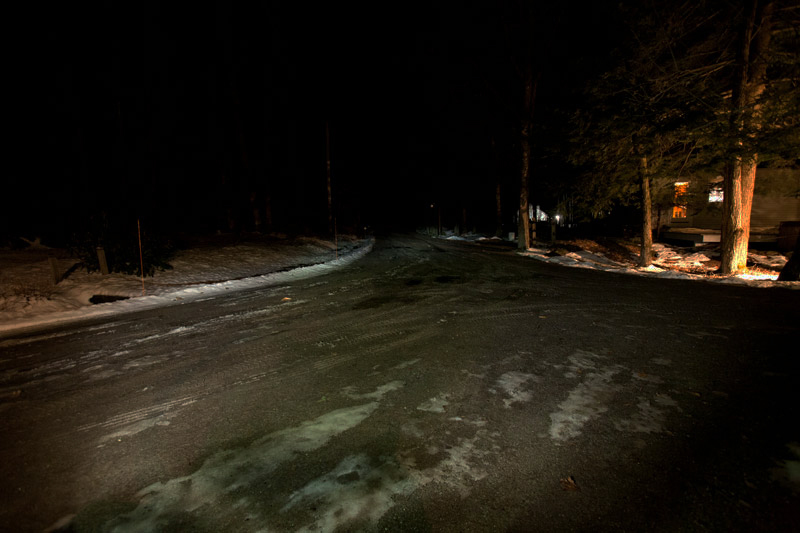 The camera's position is identical for the 2011 images, being mounted on a rigid tripod, about 160 feet from the end of my driveway. The 2008 images were shot from 140 feet to the end of the driveweay. The position of every light is almost identical, a few feet to the left of the camera and below it, also mounted firmly as it would be on a fork crown. 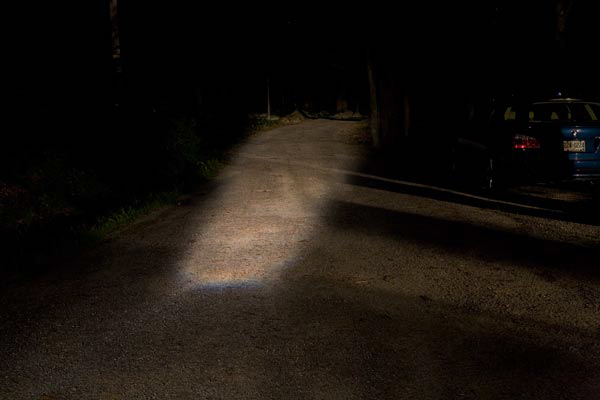 When viewing these images, keep in mind that the camera exagerates the difference in illumination between the area where the beam is focused, and the areas outside of the focused beam. There's always more light to the sides of the beam, and closer to the bike, than the images would make you think. On November 4, 2013, I processed the images on this page to darken them. Previously, I had displayed images that exagerated the brightness of the brighter headlights, and made the dimmer lights darker. This happened because the camera's exposure settings were identical in all the photos, and that results in the brighter lights appearing to be brighter than they actually are, due to differences in how a digital camera records images and the way our human eyes work. So now the images are adjusted to compensate for this. It's impossible to do this compensation in a way that everyone would agree gives an accurate representation of the relative beam brightness when comparing different lights. So, please use these images as a rough giude to beam brightness, but also as a very good guide to how these lights will perform in use, at least on dry roads. 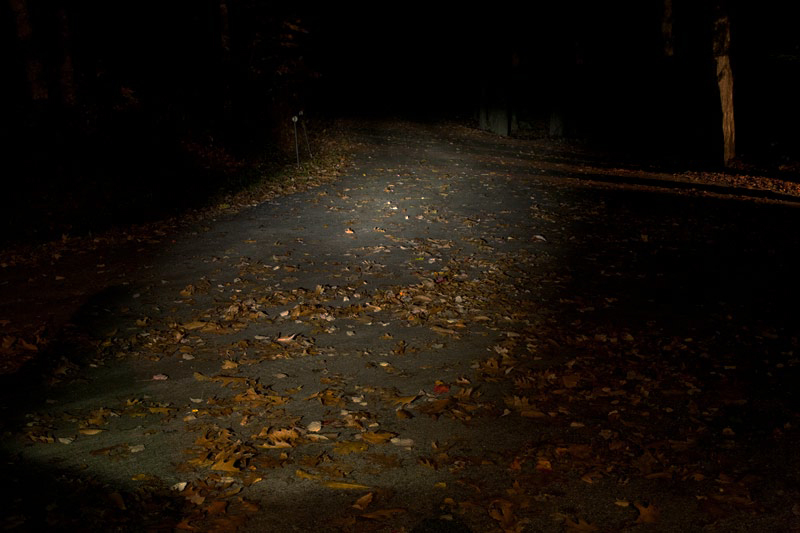 You'll find a short article about headlights here. 2008 image, 45mm lens. Here's the Schmidt E6. Until Busch & Müller introduced there IQ LED headlights, this was the very best bicycle headlight you could buy. 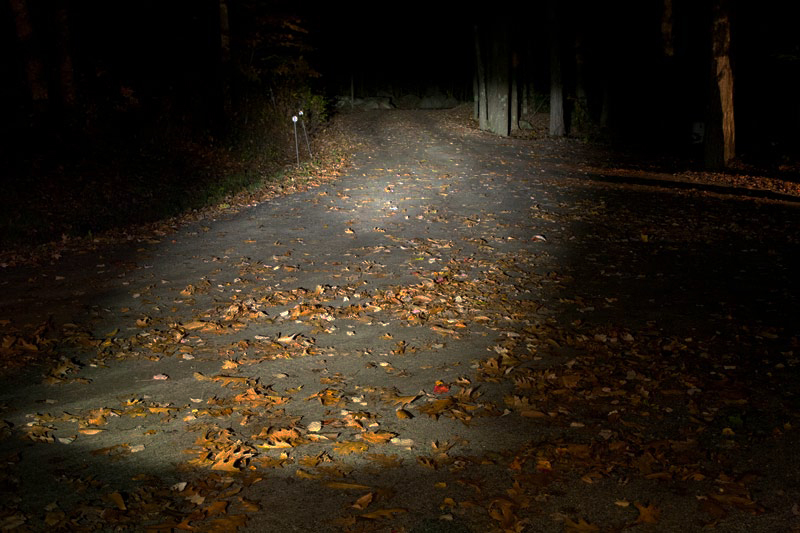 The E6 uses a halogen bulb, so the color is yellowish, and the beam isn't nearly as wide as any of the newer LED headlights. But notice something interesting. 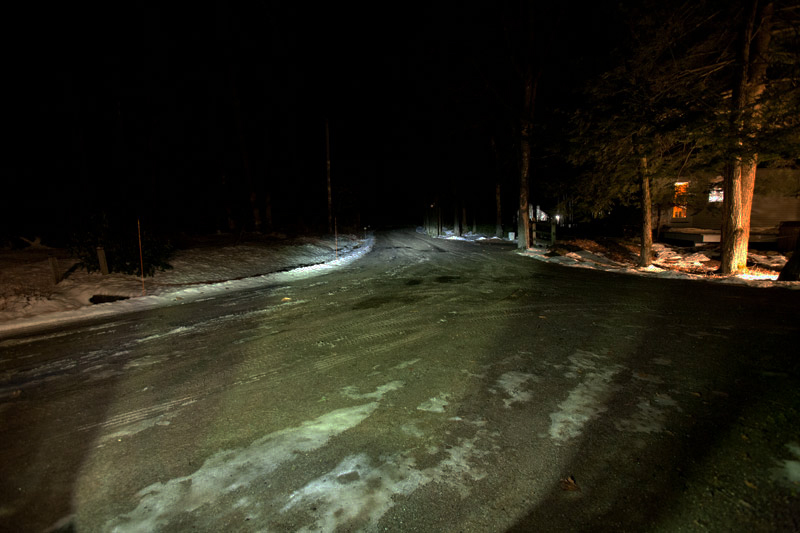 The very end of the driveway in every other image from 2008 is a bit darker than the driveway a bit closer to the camera, say one quarter of the way down from the very top of the beam. But with the E6 the end of the driveway is just as bright as the rest of the beam, except the bottom third of the beam, and that's because I'm holding the light in my hand, lower to the ground than it would normally be by about a foot. Now, all of the other images were made with the light at the same height, so the comparisons are valid. 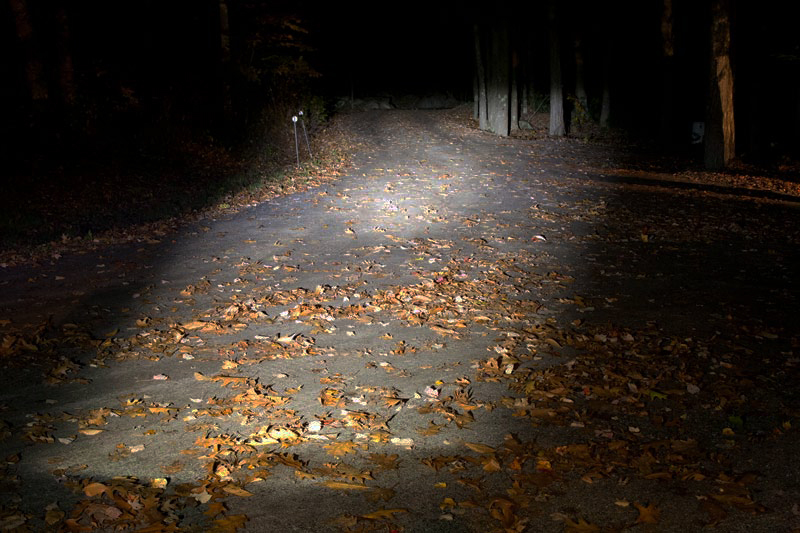 The point is that the E6 has the ability to concentrate a great deal of light at the very top of the beam, making the furthest section of road relatively brighter than other beams, compared to closer sections of the road. This is explained in my article here. So, yes, the E6 is older technology, it uses bulbs that you'll have to replace after about 100 hours of use, but the optics are very impressive, I think. The beam is narrow, so you're riding down a somewhat narrow tunnel of lit road with no other lighting. LED lights such as the Busch & Müller Lumotec IQ Fly and Cyo, Supernova E3 Pro and Schmidt Edelux all put more total light on the road, but the E6 still looks pretty good to me. Here's what I wrote about LEDs in 2008. It was true then. 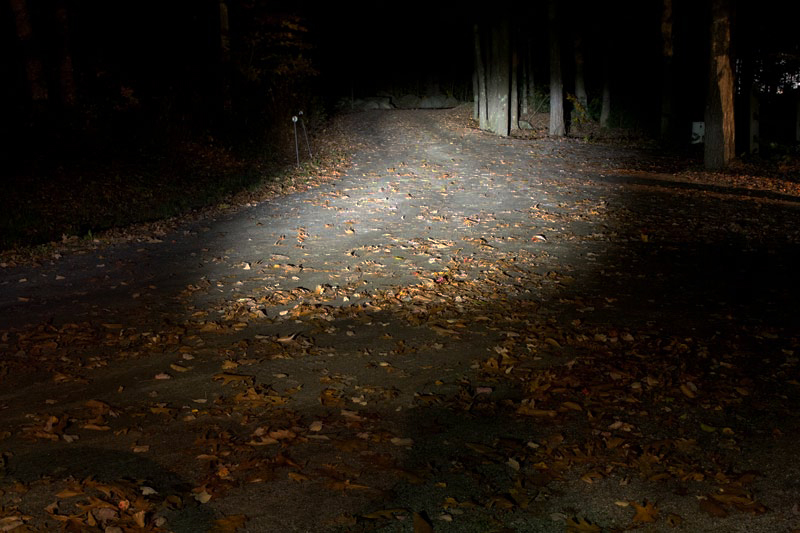 Regarding halogen headlights, older people often find that the bluish light from LEDs makes it harder to see details, particularly in the rain, than the more yellow light from the halogen bulb. Also, LEDs emit light at only a few specific wavelengths, whereas a halogen bulb's spectrum is smoother, creating light over a much larger range of wavelengths. So, sometimes, brighter isn't necessarily better. But notice the difference between beam shots from 2008 and 2009, vs beam shots from 2011. The older LED headlights all had a strong blue color, very different from the halogen headlights. The newer headlights from Busch & Müller, Schmidt and Supernova all have vastly improved color balance. Perhaps still not as good for aging eyeballs as halogen, but a lot better than the older LEDs. So, the E6 was state of the art in 2005. But things change, don't they? These next two photos were taken with the same 45mm focal length lens as all of the other photos. However, the Luxos beam is wider than this lens can capture. So I also took a few shots with a 24mm wide angle lens. They can be seen further down the page. Since even with the 24mm lens, you can't really see how wide this beam is, I then used an even wider lens. New for 2013, the Luxos U headlight from Busch & Müller. This is how the Luxos U beam looks when you're riding at speed. This is the widest headlight beam of any dynamo powered headlight I know of. And it's 70 lux, one of the brightest headlights you can buy. Notice also that the road surface closer to the bike isn't brighter than the road suface at a distance. That makes it easier to see the road surface at a distance when you're descending a hill at speed. And here is the Luxos U beam at low speed. 45mm lens. At low speeds a hub dynamo has less power available. So the Luxos U reduces the power to the primary LED and sends the remaining power to two other LEDs which project light close to the bike and to each side. This happens automatically, and gradually. In other words, there isn't a speed above which the distance beam is on, and just below that the near beam switches on. Oh no. At about 15kph, as you go slower, the distant beam gradually dims, while the near beam gradually increases. It's a very smooth transition as your speed changes. So at low speed, where other headlights are still trying to illuminate the road at a distance (where, at 8 mph, do you care?) the Luxos U is using all of the available power of the more slowly turning hub dynamo to illuminate the road up close, where it matters at low speeds. The less expensive Luxos B does not have this feature. So, how wide is the Luxos U beam? With the 45mm focal length (51 degree) lens, the camera can't show how wide the Luxos U beam is. So here I've switched to a 24mm (84 degree) lens, which has a much wider field of view. Here's the Luxos U at full speed, using the wide angle, 24mm lens. The Luxos B has the same beam as this. And here is the Luxos U again at low speed output. But even the 24mm wide angle lens isn't wide enough to show you just how wide the Luxos is. Where's my ludicrously wide angle lens? 16mm lens: Here's the beam at high speed. The Luxos B has the same beam as this. And here's the Luxos U at low speed with the 16mm ultra-wide lens. 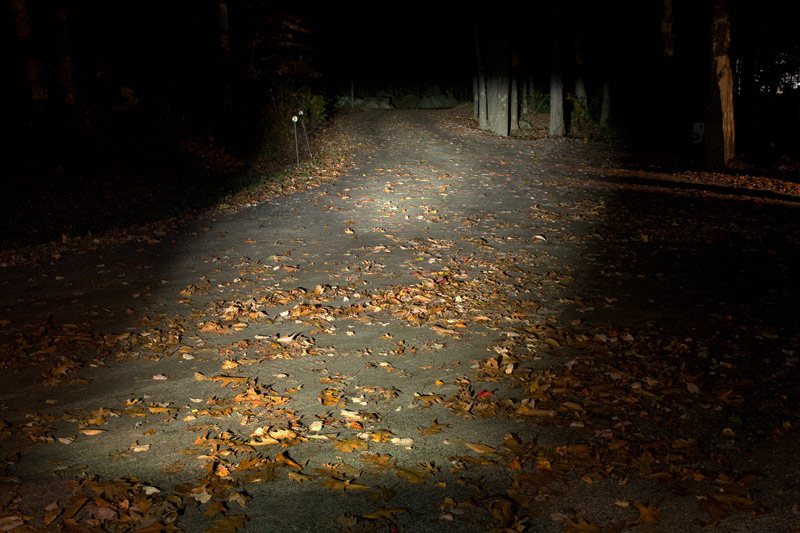 The very bright light at a distance is dimmed, but close to the bike, you still have lots of light, far more than you would have with any other dynamo powered bicycle headlight. This beam is "crazy-wide". I love it! All of the lights listed use the same mirror, made by Busch & Müller, and their Lux ratings are slightly different, they are all close enough that it's virtually impossible to see a difference in the beams. So I'm using the same photo (of the Edelux II prototype) to show how all of these headlight beams will look. In October, 2013 I received a prototype of Schmidt's new Edelux II headlight. I put it on my bike and went for a ride. I was amazed. Here's why. Oct 27, 2013 image, 45mm lens. I set up the camera during daylight, as usual, so I would get everything in sharp focus. I wasn't prepared for the beam to be quite so wide, even though I'd been riding with it for a few nights. Once I get production headlights from Schmidt I'll set up the rig again with a wider (24mm) lens. The production lights are identical to my prototype, except for improved water sealing, so no need for more photos. This headlight is outstanding. It has much better near-field illumination of the road than the original Edelux, without that near-field illumination being too bright, which would make visibility at a distance difficult. And the beam is really wide. I never felt that the original Edelux beam was too narrow, but after riding with this new light, I have no desire to go back to the old version. 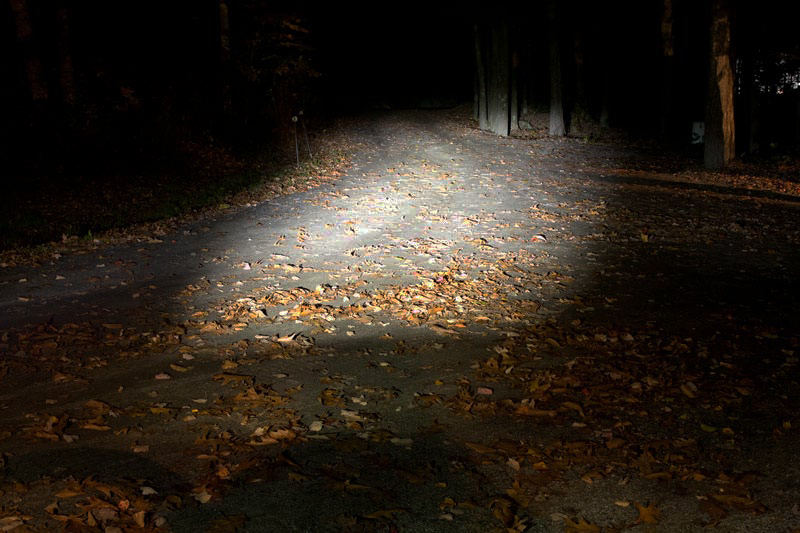 I find it more relaxing riding with this wider beam on our unlit back-country roads, which is 90% of my riding. When I head into town, where there is overhead street lighting, the wider beam makes no difference to me. This headlight uses Busch & Müller's new IQ Premium reflector, which will be used in their new IQ Premium Cyo and IQ Premium Fly RT headlights. I'll have those new headlights in early November, and the production Edelux II by late December. I expect the beams to all be quite similar, with only slight differences in brightness; too small to be really noticeable while riding. This extraordinary new headlight is tiny, yet has a beam almost as wide as the original IQ Cyo headlights, but with even better near-field illumination. This is a terrific headlight for riding in urban traffic, especially with overhead street lighting. It's also very good for dark country roads at speeds up to about 20mph, at least for my 59 year old eyes. For hilly terrain on otherwise unlit roads it's not ideal because there's a bit too much light close to the bike, so on a fast descent you'll be a bit less able to see things well at a distance. Keep in mind that I'm writing this in 2013. It's only been about seven years since the lights we had weren't even close to the performance of the Eyc. 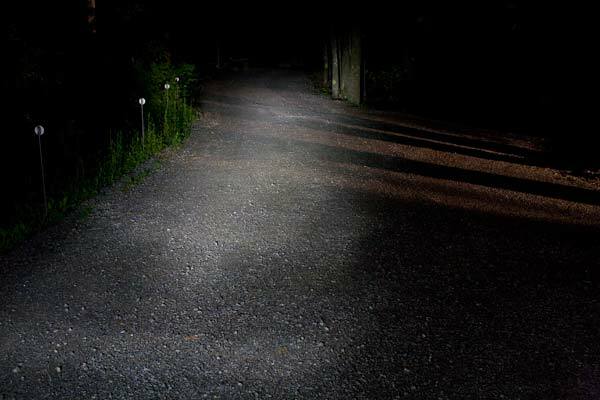 Had the Eyc been available in 2006, it would have been the very best bicycle headlight you could buy at any price, for any purpose, including fast descents. It's only when compared with the very latest headlights such as the IQ Premium, Edelux II and Luxos headlights that the Eyc falls a bit short. The lithium battery powered Ixon Core has the identical beam. And it's tiny too! The Ixon IQ is powered by 4 AA NiMH batteries. 2011 Image, 45mm lens. 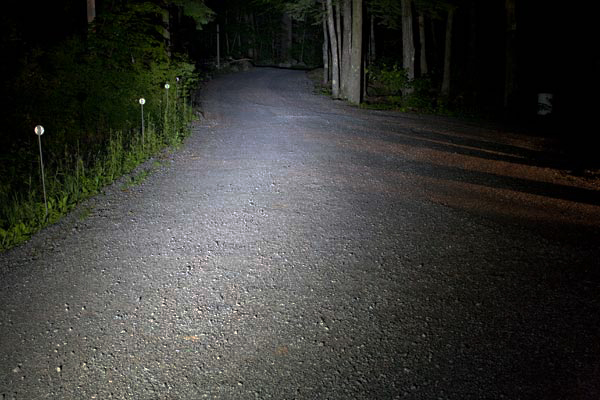 Here we have a very bright LED headlight, the B&M Ixon IQ. This photo shows it at full power. If you have a hilly route this is what you need for the descents. As of Fall, 2010, the Ixon IQ beam has the same shape as the Lumotec IQ Fly RT, seen below. So there is now plenty of light projected close to the bike, and the distance beam is just as bright. 40 Lux. By the way, the shape of the focused beam of the Ixon IQ, is identical to the Lumotec IQ Fly, IQ CYO R and IQ CYO RT. All of them use the identical mirror to focus the light from the LED. 2011 Image, 45mm lens. Here it's aimed a bit lower, but I've also set the output to the low power setting. This is bright enough for many conditions. Use it at full power in the rain and on busy roads. Otherwise, save your batteries. 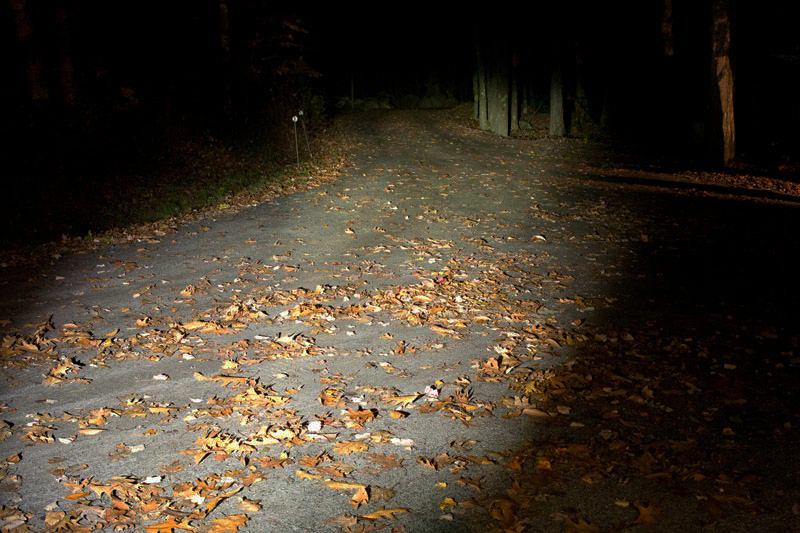 On a dark country road, when you're not competing with oncoming automobile traffic, you don't need as much light. 2011 Image, 45mm lens, Lumotec LYT. This is Busch & Müller's moderately priced LED headlight for commuters. Here it's just been switched on. 25lux. The LYT headlights are particularly good for the urban commuter. They shine a lot of light directly to each side, so at intersections you'll be more obvious to drivers. 2011 Image, 45mm lens. 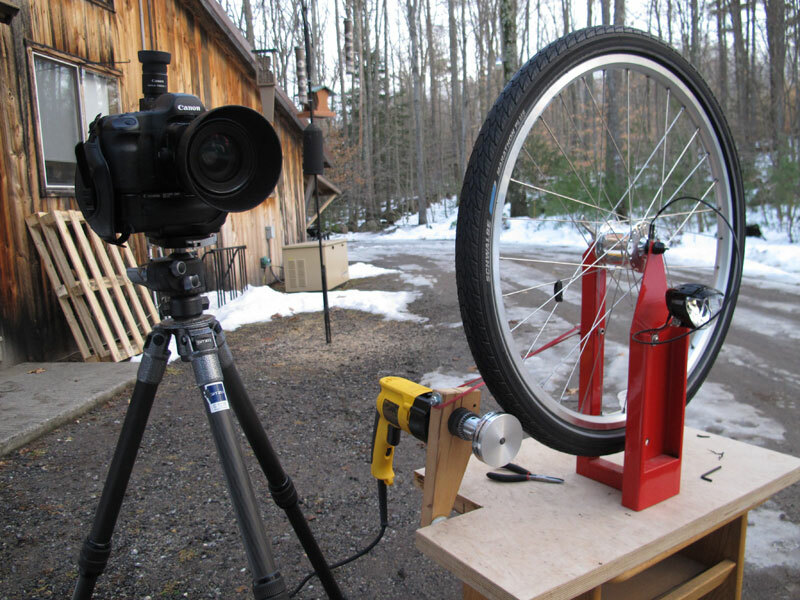 The Edelux uses the same reflector as the Lumotec IQ Cyo, but pretty much everything else is different. 2011 Image, 45mm lens. Here I've lowered the beam a bit. Notice now that the beam is brighter; only because it's aimed a bit lower. 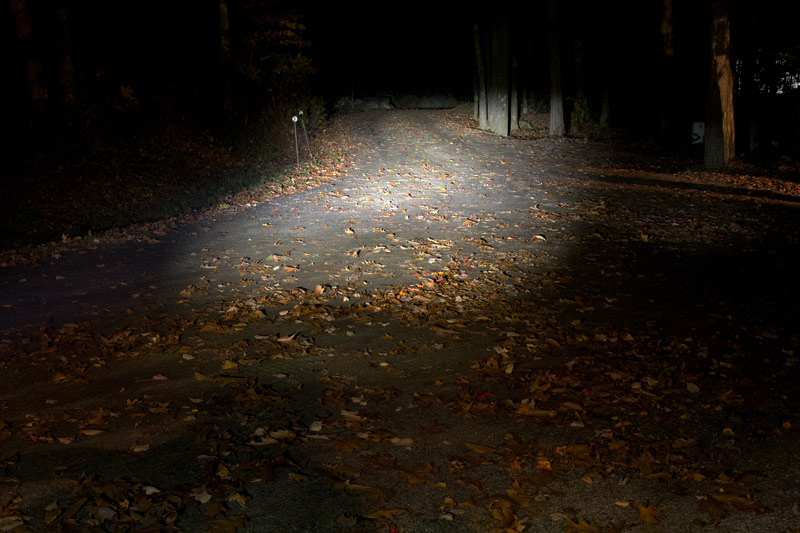 This will happen with all bicycle headlights. 2011 Image, 45mm lens. The IQ CYO is Busch & Müller's brightest dynamo headlight. 60 lux. The Cyo has a large heat sinkon top to keep the LED cool. The lower the operating temperature of the LED, the brighter it runs. The CYO keeps up with the big boys in the battle for brightest dynamo headlight. 2011 image using the E3 Pro, same beam as the Pro 2, a few seconds after switching on. The bottom of the image is about 7 feet from the camera lens. 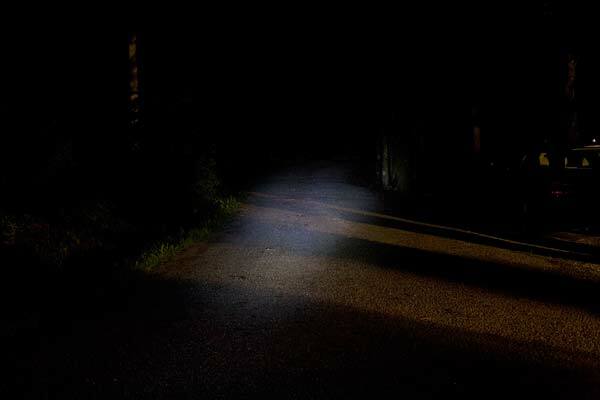 So you can see that this beam is very tall, illuminating the road close as well as at a distance. The beam is also very wide. 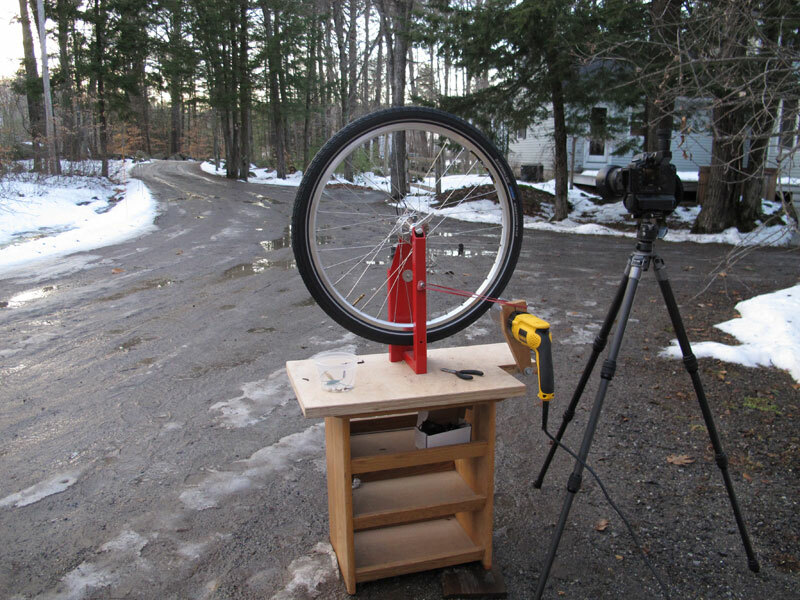 Here's the E3 Pro Terraflux mounted 15" off the ground, the same height it would be if you use one of those mounts that put your headlight on your front hub skewer. 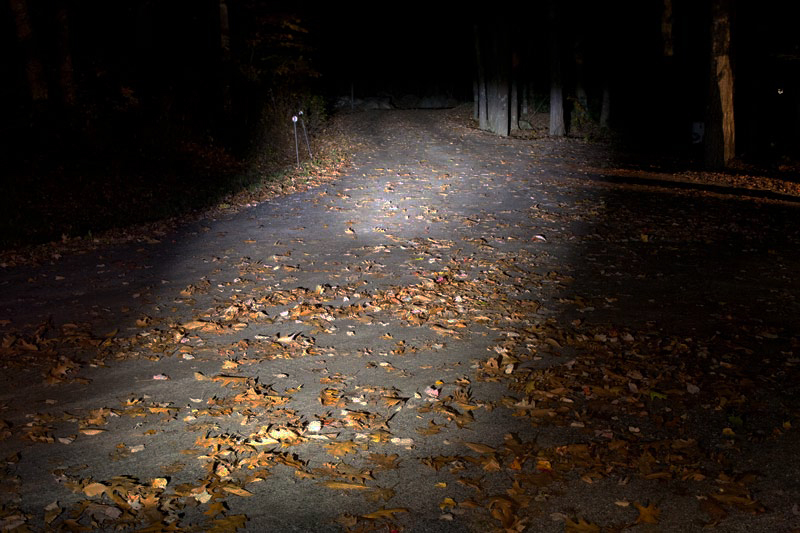 Some people like having their light mounted low since it accentuates irregularities in the road surface, and helps you to see junk on the road easier. See how the shadows of the leaves are enhanced? The same would happen with a pothole or a piece of glass. But there's a very serious detrimental effect. Notice that the road at a distance isn't as bright, and the road up close is much brighter. Having the road surface close to you so much brighter makes seeing at a distance more difficult, as the bright road surface up close overwhelms your vision. No bicycle lights I know of are designed to be mounted this low. The good German lights I sell are all optimized for mounting at the top of the front tire, bolted to the fork crown. Their distribution of light assumes the light is about 3 feet off the ground. I'm not singling out the Supernova headlight for criticism here. The same effect would be seen if I had used any of the Busch & Müller or Schmidt headlights. They all should be mounted close to the height of the fork crown if at all possible. 2009 image. The Triple uses three LEDs, so it's a bit brighter. Also, the round beam is larger. It's more of a flood light than a spot light. 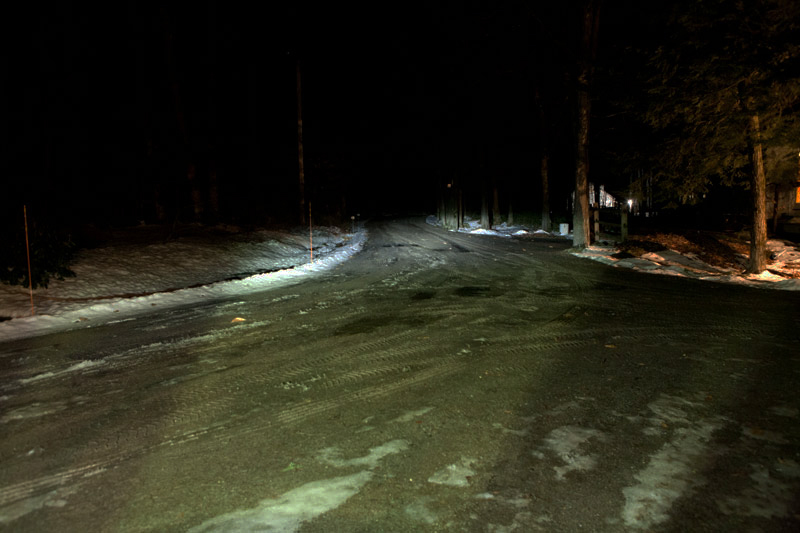 The driveway surface is washed out a bit in the E3 photo, so the E3 Triple, being brighter, is still just washed out on the road surface. 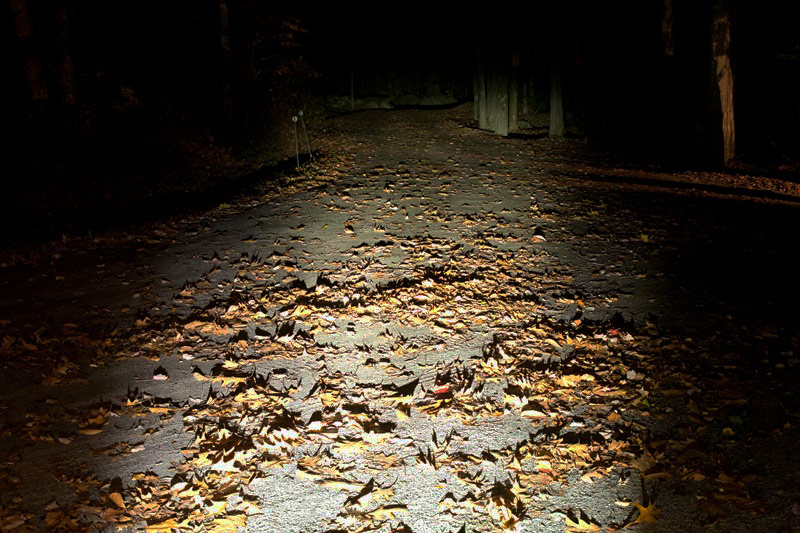 It's easier to notice the differene in brightness by looking at the trees and leaves, particularly straight down at the end of the driveway. The E3 Triple image was made a couple of weeks after the E3 image. Same camera exposure settings, but the foliage is grown in a bit more. I highly recommend the Triple for riding a mountain bike in the woods. The huge beam illuminates overhead branches very well, along with the trail. With the E3 Triple, dynamo lighting for mounting biking makes sense. But you shouldn't use this headlight for riding the roads. It focuses far too much light into the eyes of oncoming drivers. 2011 Image. 45mm lens. The Airstream has the same optics as the E3 Pro Terraflux. It's just brighter. 2008 Image, 45mm lens. 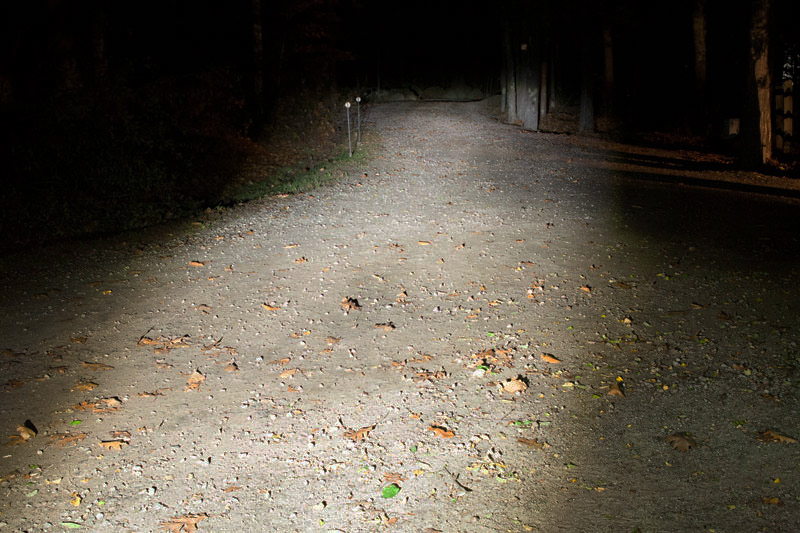 The Luceo has the same total light output as the Lumotec Fly, but spreads it out a bit more. 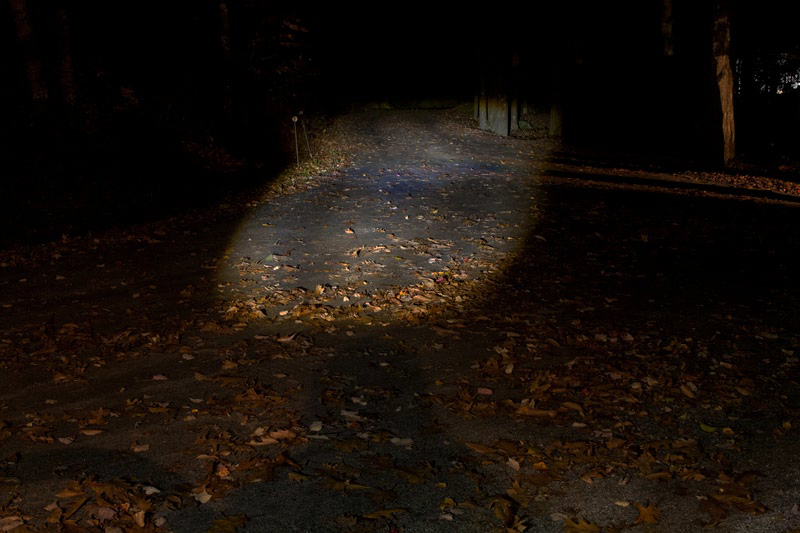 The bluish LED light has a different effect than the halogen bulb and in some situations may not provide as much brightness for the rider, but certainly puts the available light over a larger area than the Fly. The Luceo is available in both dynamo powered and battery powered versions. The light output is identical for both types. The version used here is the dynamo version. Both versions mount only at the fork crown on bikes using either V brakes or disc brakes. These are now 40% off their regular prices. The Luceo has enough light output for most situations. This comparison is perhaps a bit misleading, as the Luceo is best suited for the slower cyclist, and should be aimed a bit lower. When aimed lower, the light patch is positioned closer to the rider and it's quite a bit brighter on the road. So instead of the top of the beam being 140 feet away, 75 feet or so would be better. That's plent if you're riding at 10 to 12 mph. In the rain, it may not give some riders enough light to see the road well, but will give other road users enough light for them to know you are there. So in an urban environment with overhead street lighting, it's ideal. In dry conditions, it's plenty of light for moderate speed riding, say 10-12 mph. Just stay away from steep descents. For the good weather commuter, either rural or urban, it's all you'll usually need. 2008 Image, 45mm lens. These lights are no longer available, but a lot of people use them and so it's useful to have them shown here for comparison. This image was made with the DLumotec. Please take my word for it; the Ixon beam is identical. It uses the same LED and the same reflector. The DLumotec is dynamo powered, the Ixon is battery powered. I really like this headlight for anyone riding at moderate speeds. It has plenty of light right in front of the bike, so working your way through potholes and glass on city street is safer, and you still have enough light at a distance to make cruising at 18mph comfortable. There's enough spill light above the focused beam to make it easy to see street signs. BUT BUT BUT PETER!!!! BRIGHTER IS BETTER!!!! Right? Uh, well, yeah, but if a light is bright enough, and costs less than a brighter light, and if the less expensive light has a more useful beam with spill light illuminating road signs above the road surface and lots of light close to the bike, is the brighter light necessarily better? And please remember what I wrote above. 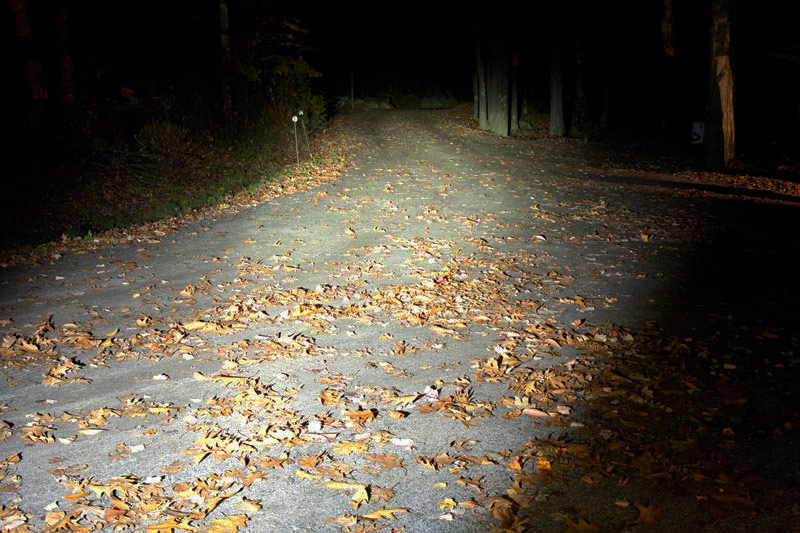 These images exagerate the brightness of the brighter headlights, and exagerate the dimness of the dimmer headlights, by comparison. 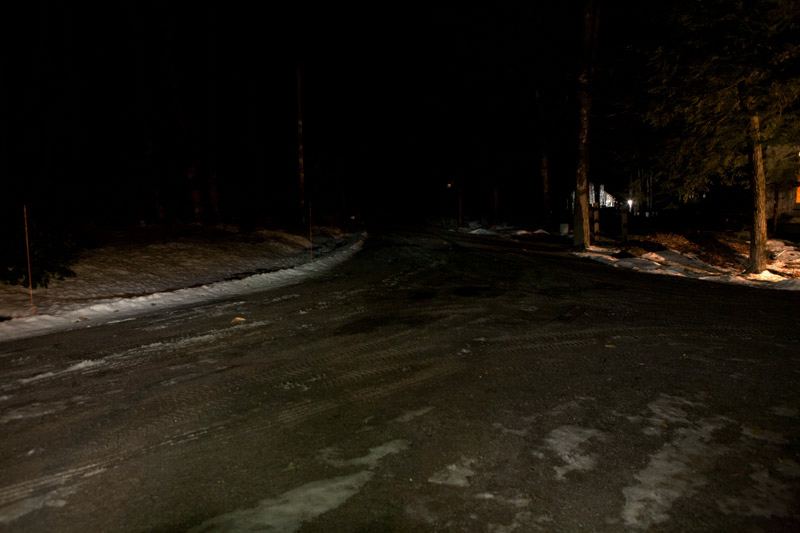 I could easily manipulate these images in my computer to make the dimmest headlights seem extremely bright. 2011 Image, Inoled Extreme. Inoled was the first to make an LED headlight with modern optics for dynamos. It can be powered either by an Inoled battery or a 6 volt dynamo. All halogen dynamo headlights I sell use the same bulbs; either the 2.4 watt or 3 watt bulb. If used with a .6 watt taillight, use the 2.4 watt bulb. If you prefer a battery taillight, use the 3 watt bulb in the headlight. 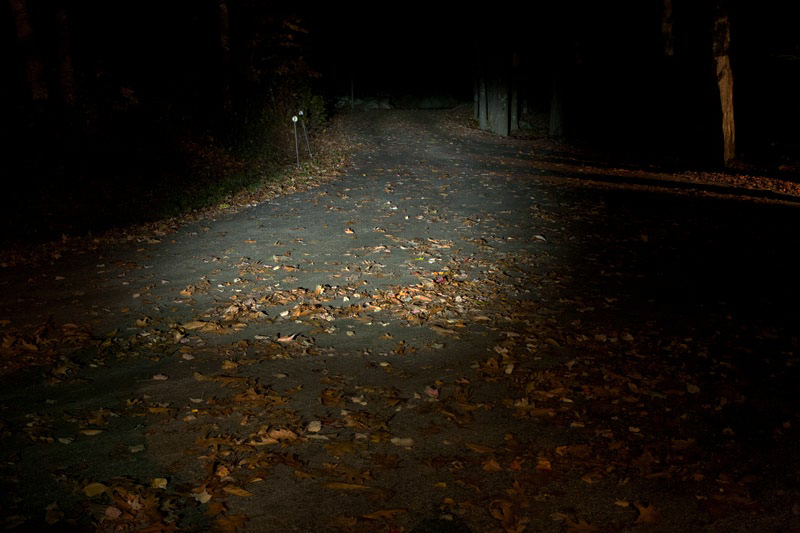 Most LED headlights can be used with or without a taillight. If you use the Inoled Extreme powered by a dynamo hub, you must use a taillight and Inoled's "Inoguard" wire. None of these headlights should be positioned upside down. In the case of the Busch & Müller, Spanninga, Inoled and Supernova headlights, that can allow water to collect in the housing, possibly shorting out your lights in the rain when you need them most. But more importantly, by rotating the lens upside down, the brightest part of the beam hits the road closer to you, making for a light that is next to useless for clearly seeing the road ahead for any meaningful distance. This doesn't apply to the symmetrical Supernova E3 Pro, but it does apply to the Asymmetrical Terraflux E3 Pro. While the Schmidt headlights are impervious to water penetration, placing it upside down is still silly, since you've spent so much money for a carefully refined beam pattern, and by reversing it, you make the light beam worse than the cheapest dime store flashlight. Metric connectors attach the wiring to some of these headlights. These metric connectors are virtually impossible to find in the United States. But I stock them by the hundreds. So if you have any concerns, buy some extra connectors when you purchase your system. They are very inexpensive. Some headlights are hard wired for attachment to the Schmidt SON dynohub. All have connectors to attach optional taillights. We stock lots of wiring and connectors to allow many configurations for your bike. We don't have a package as such, since everyone's bike is a bit different. We prefer to sell you exactly what you need to give you the best lighting for your needs. For more information about lights for the Schmidt hub, go to the Schmidt headlight page. Every light here is distributed in the US and Canada by Peter White Cycles. Any bike shop can order these lights directly from us. See this page for more information about setting up an account.